The last weekend of May is an important one for quilters in Southern Alberta - Calgary in particular. It's when Heritage Park hosts the Festival of Quilts and Gathering of the Guilds and hangs quilts everywhere in the Park for everyone to enjoy. Quilts are hung outside on clotheslines and fences, inside tents on the grounds, and inside the heritage buildings throughout the park. 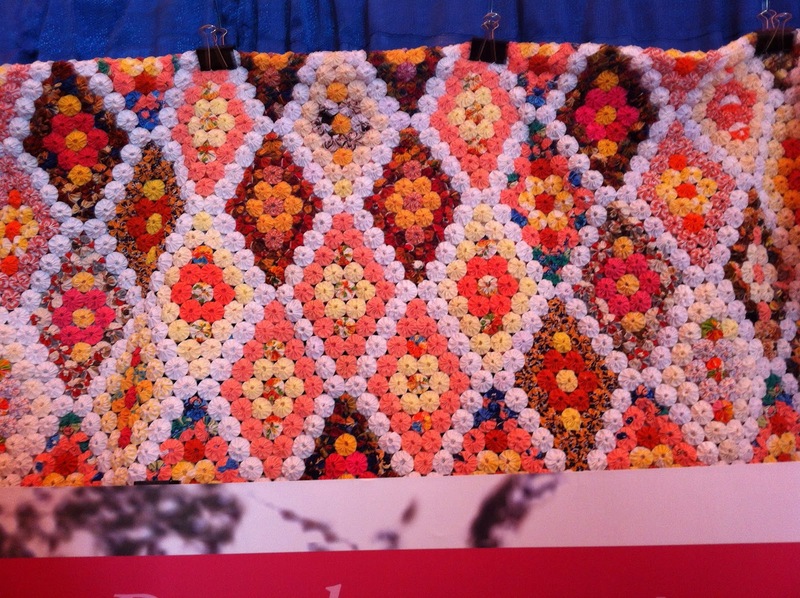 As a quilter, it is always inspiring to go and see what other quilters are working on and finishing! This year was no exception and I found lots of quilty eye candy! 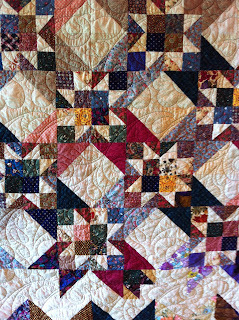 I am continually drawn to scrappy quilts and there were many to see this year at Heritage Park. 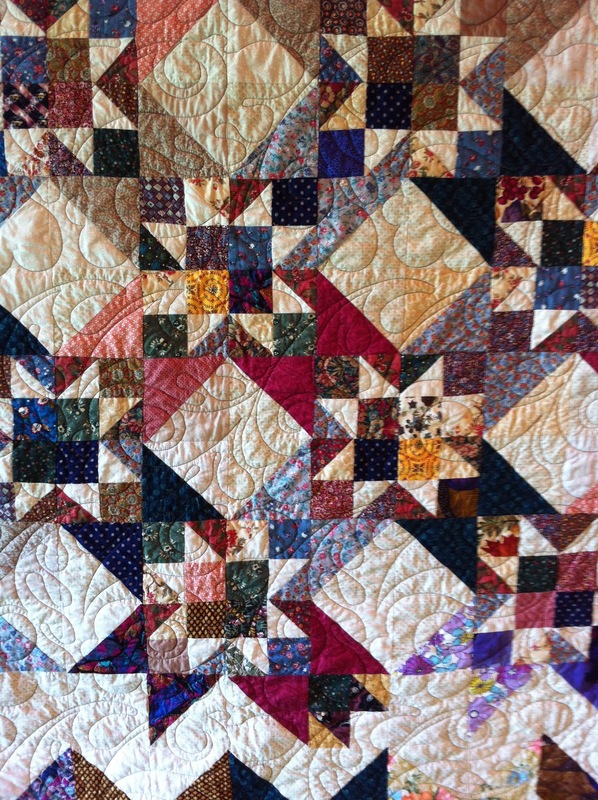 I think this scrappy star quilt was one of my favourites. With the Bow River flowing through the center of Calgary, this was an interesting play on a couple traditional patterns. The storm at sea block is a perennial favourite and bow tie centers were a unique twist. Yo yo quilts are making a come back and I'm seeing them more often than at any time since I started quilting many years ago. I think this was a vintage quilt, but the fresh orange colours are very in fashion these days. Oh, for a second story railing to hang quilts off of! This is always an impressive view as quilts are hung from 2 sides of the hotel building. Unfortunately, my phone was not up to taking a decent picture of a full side, so you're only getting a peek at a small section! I think there were more art quilts displayed than I've seen in the past. This underwater art quilt was a beautiful interpretation of ocean blues and I wanted to show the awesome thread work. Just click on the picture to enlarge! I came home inspired to create and to plan to enter one or more of my own quilts in this non-juried show for 2013. It all starts with. . .